Veale has the best outdoor advertising options available to Sacramento businesses, events, and causes. 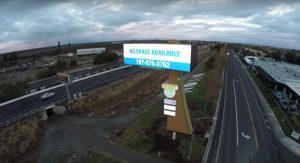 We can help you secure spaces for some of the best billboards available, including I 80 billboards. You will be able to broadcast your message to a large audience, easily catching their eyes and inspiring them to take action. Your billboards will be seen by millions of commuters each month. We offer numerous options for traditional static billboards and modern digital billboards. Veale Outdoor Advertising has been in the business since the 1980s, giving us a leading edge on the local, regional, and national advertising markets. Television and radio advertising has a much more limited scope of audience because advertising only reaches their listeners and viewers. The I 80 billboards can be seen by thousands of commuters each day. Just by passing by your billboard sign, commuters will learn about your business, sale, or event. By opting for the best outdoor advertising option in Sacramento, your business will immediately notice an influx of business and opportunity. Commuters who travel long distances often make very high levels of income, meaning that your billboard along I 80 can reach some very promising investors and customers. Our billboard company supports the growth and sustainability of local businesses. If your business seeks the best outdoor advertising in Sacramento, contact the experts at Veale. Our advertising professionals will work closely with you to understand your specific advertising needs. Our goal is to help you launch your most successful marketing campaign. Give us a call today to learn more.